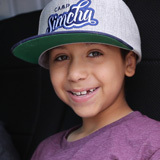 Aviv is a true Chai Lifeline warrior, and we are excited to have him as our Honorary Captain this season! At first Paz was nervous to send Aviv away to camp for two weeks, but looking back she says it was the best decision she ever made. 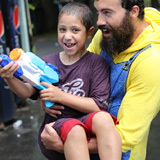 The friendships he made, and the high-energy vibe of Camp Simcha infused Aviv with laughter and hope, and most importantly nurtured back his childhood. Camp Simcha is truly a magical place. Favorite Book: Harry Potter, of course!